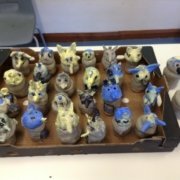 In keeping with our recent mummification learning in year 3 the children had the opportunity this week to look more at the importance of canopic jars in the mummification process. After understanding which organs went in the jars the children designed their very own! 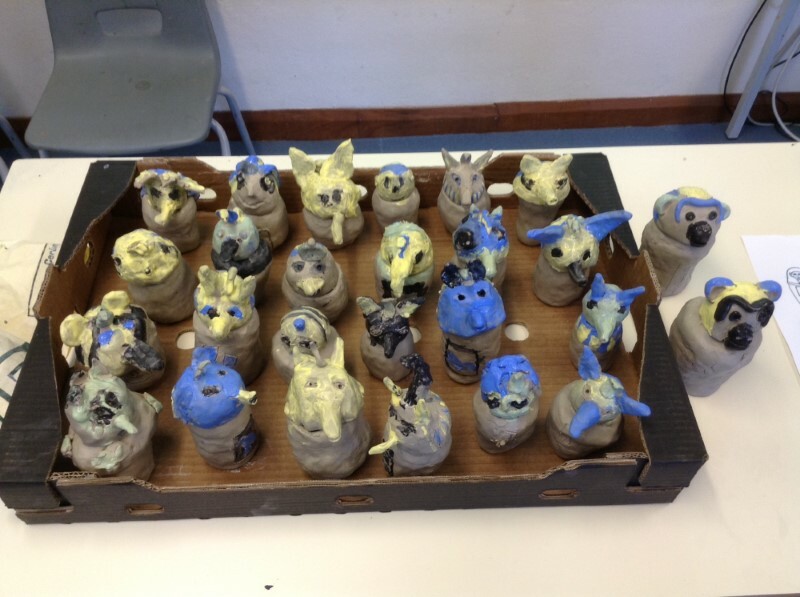 With the expertise of the wonderful staff from Leach Pottery the children then used clay to sculpt their designs into the real thing! The creativity all the children showed was superb and the end results were fantastic. We cannot wait to get them back from the kiln! https://www.stivesjunior.org.uk/wp-content/uploads/2019/02/y3-canopic-jars-10.jpg 597 800 Mr Moon https://www.stivesjunior.org.uk/wp-content/uploads/2017/01/New-Website-School-Logo-G.png Mr Moon2019-02-11 11:14:392019-02-11 11:14:39Y3 Make Canopic Jars! 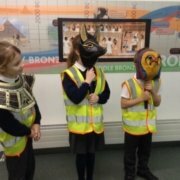 Year 3 stepped back in time last week, as they visited Truro Museum to discover more about the wonders of Ancient Egypt. 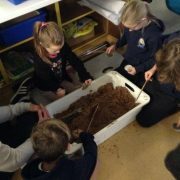 The children spent the day studying ancient artefacts, digging in sand like real archaeologists to work out the importance of each one. They also learnt more about the mummification process and met the museum’s real mummy, finding out more about his life. The children also got the opportunity to act out the journey to the afterlife the Ancient Egyptians believed in. The children were all so absorbed throughout the day, asking incredibly thoughtful questions to find out as much as possible from the museum experts. It was a truly wonderful learning experience! On Monday, year 3 dived into their Ancient Egypt learning with an action packed launch day. 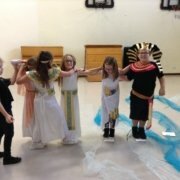 To gain entry to the Pharaoh’s banquet the children had to complete a series of challenges; decode hieroglyphics, make Egyptian jewellery, find artifacts in the dark tomb, work as a team to cross the River Nile and build a sugar cube Pyramid. What an EPIC day we all had! 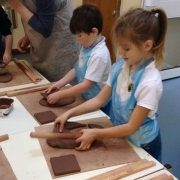 Year 3 enjoyed a creative day sculpting clay poppies under the expert guidance of Michaela. Having learnt about the importance of the poppy and it’s symbolic importance when remembering all of the soldiers who lost their lives during World War One. We spent the day creating a poppy tile to be part of a whole school display as well as a range of different poppies using our new found clay skills. The finished pieces looked superb! 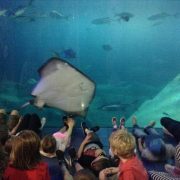 Year 3 have recently been on an epic adventure ‘Sleeping with Sharks!’ at Plymouth Aquarium. The overnight adventure began with a visit to the marvellous Eden Project. The children explored the Mediterranean and Rainforest biomes making priceless learning links between their first hand experiences and previous learning in the classroom. We passed numerous tasks to become rainforest rangers; learning how to use machetes to cut a path through the dense Amazon understory to locating suitable plants to eat and make shelter from whilst in the rainforest biome. After enjoying the tropical wonders of Eden we were back on the coach heading for Plymouth. Our first stop was Pizza Hut to refuel. The pizza and ice-cream was perfect and gave the children time to share stories of their time at Eden. Finally it was time to head to the aquarium! On arrival our guides met us and showed us to ‘camp’ for the evening which was next to one of the aquarium’s most impressive tanks. Over the course of the evening the children explored the aquarium and our guides told us fascinating facts about a wide-range of aquatic creatures. As it drew closer to midnight the children sat silently at the edge of the shark tank with only the light of the artificial moonlight lighting the room. The children watched in awe as the graceful sharks came to life swimming right over their heads. After some time mesmerized by the beauty of the sharks and other creatures swimming we settled down in our sleeping bags for a film and a midnight feast. After breakfast the next morning the fun continued as we made our way to Plymouth Pavilions for ice-skating. There were smiles all round as every child took to the ice. The resilience they all showed when on the ice, even after some took a tumble or two, was superb and by the end of the session the confidence levels and skills had developed incredibly over such a short time. Overall it was a truly wonderful trip, packed full of excitement and adventure and all of the children in year 3 were a real credit to SIJS. Y3 Temples, Tombs & Treasures! On Monday 8th January Year 3 launched their Temples, Tombs and Treasures spring term topic. The day was full of exploring, investigating and discovering with a range of exciting activities. The children designed and painted their own sarcophagus, built pyramids from Lego, created their own Egyptian style jewellery and even braved the dark tomb to find fascinating facts. Year 3 are now very excited about discovering more about the wonders of Ancient Egypt. https://www.stivesjunior.org.uk/wp-content/uploads/ngg_featured/y3-tttlaunch-2018-2.JPG 598 800 Mr Moon https://www.stivesjunior.org.uk/wp-content/uploads/2017/01/New-Website-School-Logo-G.png Mr Moon2018-01-09 12:42:412018-01-09 12:43:51Y3 Temples, Tombs & Treasures! On Thursday 15th June, pupils in year 3 set off on an epic adventure in a double decker bus to discover more about ‘Habitats’! Arriving at the Eden project, pupils explored two contrasting habitats: rainforest and Mediterranean and were fascinated by the variety of plants and their amazing properties, as well as the lizards and the rainforest birds. After crossing the Tamar for tea at Pizza Hut in Plymouth (with ice-cream to finish) pupils headed to Plymouth aquarium for an immersive marine experience. There they found out many interesting and disgusting facts about many different marine creatures. Did you know for example that a sea cucumber eats poo? Or that a sea urchin makes it’s bed out of a massive sneeze? The last stop of the night was the shark tank, where pupils even managed to get a glimpse of Friday, the new Green Turtle at the aquarium. 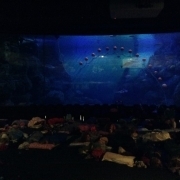 Pupils then set up sleeping bags and settled down in front of the main tank for ‘Finding Dory’ accompanied by midnight snacks. The next morning, after packing up and eating breakfast in the cafe, pupils set off for Plymouth Pavilions for an ice-skating extravaganza, making rapid progress with virtually everybody able to skate without using the wall by the end of the session. What a fantastic experience for all. Thank you year 3 for your enthusiasm and positivity throughout! On Monday 24th April, year 3 were very excited to welcome Squashbox Theatre into SIJS. Everyone thoroughly enjoyed ‘Tales from the Trees’ and through the fun and laughter, we found out lots of interesting facts about trees and the wildlife that lives in them. The children particularly loved meeting ‘Teresa Green’, a very knowledgeable young woodland explorer, and Gilbert Godrevy with his fascinating plant specimens. 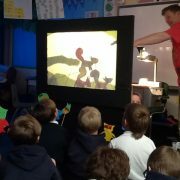 After the show, Craig from Squashbox worked with each class to help them produce shadow puppets on a woodland theme. We will be using these in our storytelling for the rest of the week. What a fantastic start to our new ‘Habitats’ topic! 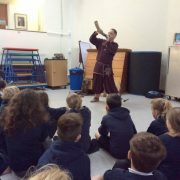 Year 5 were captivated by the outrageous adventures of the Norse gods and their war with the giants during our Viking storytelling morning with Dave Oliver from Rattlebox Theatre. From bloodthirsty tales of Viking battles to hilarious accounts of Thor’s lost hammer, there was something to entertain everyone (especially the adults, who were just as engaged as the children!) It was a brilliant opportunity to consolidate our Viking learning from the term and gather inspiration to use in our learning. We can’t wait to write our own Viking stories during English this week! Year 3 were visited by a storytelling pirate in the afternoon. The rapt audience were amazed to find out how the sea got salty with the use of a magic salt mill, how you can escape from a mermaid and how to capture a pirate. Year 3 have picked up some tips to use in their own storytelling with shadow puppets. 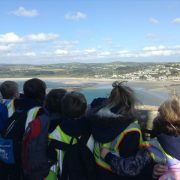 On Wednesday 5th October, year 3 set off on a quest to discover the legendary secrets of St Michael’s Mount. Arriving at Marazion, our intrepid explorers headed for the tiny passenger boats with nervous excitement bubbling in their tummies. The sea was choppy, which made for an exciting ride! On arriving safely on the Mount we headed into the grassy picnic area and together we told the story of Tom and the giant. Our task today was to discover the legend of another Cornish giant: Cormoran. We spent the morning looking for evidence that the Mount was built by a lazy, boulder throwing, cattle-munching giant whose life was cut short by a brave lad from Marazion. After lunch, we toured the castle and found out a bit more about the residents of the Mount after the giants had departed. Soon it was time to head back to the mainland via the Giant’s Causeway, bathed in Autumnal sunshine. Thank you to year 3 for making your first educational visit at SIJS a truly positive and memorable experience!